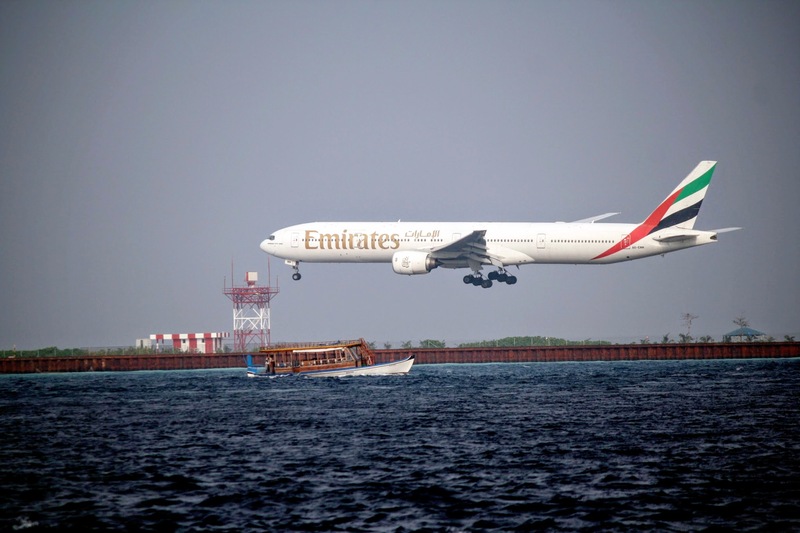 Dubai-based Emirates airlines has announced that it will begin a third daily service to Malé, the capital of Maldives. The Dubai-based airline Emirates announced in a statement that it will introduce a third daily flight service, which will begin on December 1st, adding seven more inbound flights a week to Maldives and will help boost cargo and passenger capacity on the route. Boeing 777- 300 ER aircrafts will be used for the proposed new flights. These flights are with a two class configuration which will add 294 business class and 2702 economy class seats each way on this route. The cargo capacity will increase by an additional 23 tonnes per flight. The carrier which first started flight services to Malé in 1987, presently operates two daily flights to Maldives with a third flight to Colombo, Sri Lanka stopping over in Malé. The Emirates has been growing exponentially since introducing new routes and expanded capacity. They have declared a profit growth of DHs 1.9bn for the first half of this year and expect an 8-10% growth in the coming months with the introduction of the new routes and flights. Records show the airline carried 23.3 million passengers between April 1 – September 30, up 8.4%, the statement said.